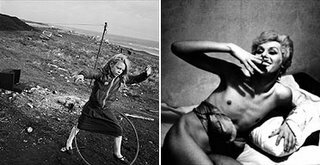 War, poverty and terrorism, or everyday intimate moments—the camera captures both global events and ordinary lives. Blake Morrison reflects on the history of 20th-century Europe as told in photographs. "There is a war in Iraq, people are dying by the boatloads, the hurricane in Lousiana just wiped out a city... but you know what, not one news PJ will make as much this month as me, cause I have Brittney Spears changing a dirty diaper in front of a supermarket." After the Asian Tsunami I overheard another conversation he had with a PJ out in Thailand... my boss wasn't interested in photo's of the devastation, he wanted shots of Petra Nemcova in hospital. My philosophy has become jaded by the influence of popular culture on my profession. In the modern world "who's banging who" is often more important than "who died". Bad news is... this isn't likely to change anytime soon. Since the early 20th century people were taking photographs of human atrocities under the moralistic license of, "We must never forget". Sure enough 25-30 years later some new photographer is shooting some new atrocity under the same license. Scrapbooks of horror have no meaningful effect on the human condition. At best they en-fame the photographer and/or the event. Western society's preoccupation with celebrity is certainly nothing new, either. Photography has been a principal panderer to this phenomenon for a very long time. Our relatively affluent Western society has enabled the prolongation of adolescence to nearly 30, affording an enormous celebrity worship capacity expansion in all media. The media, finding not enough truly accomplished people to celebritize, has used photography to create a new genre of celebrity; someone who is famous simply for being famous. Of course photographers making a living (and sometimes celebrity) from this business don capes and glasses tinted in much loftier principles of art and craft. Young people worship these photographers and "would die" to follow their footsteps. It all makes me think (again) of the German war writer and thinker, Ernst Jünger ... During Second World War he spent most of his time in Paris. When some parts of the city one day was being bombed, he enjoyed watching the bomber airplanes through a glass of fine red wine. He was a real aesthetic! Thanks for the link. The work of Henryk Ross, whose power and ambiguities are discussed at length, is still in print and available at Amazon. And the exhibit catalog for this show is due out in a month or two. Both sound worthy of acquisition.